70 years before Christopher Columbus sailed across the Atlantic in search of a water route to Asia, the Chinese were exploring the Indian Ocean and western Pacific with seven maritime expeditions that solidified themselves as the major power in Asia. In 2005 China celebrated the 600th anniversary of the first voyage of the navigator and explorer Zheng He. In 2005 China celebrated the 600th anniversary of the first maritime expedition of Zheng He (1371-1435), also known as Cheng Ho. Zheng He is China’s most famous navigator, making a total of seven expeditions over 28 years to 30 countries across Southeast Asia and the Indian Ocean, the Persian Gulf and even the east coast of Africa. Some historians even argue that Zheng He’s ships traveled as far as Australia, some 300 years before Cook. He was born in the Yunnan province in 1372, about the time that Genghis Khan was defeated by the emerging Ming dynasty. His parents were Muslims who fought for the Khan, and at 10 he was captured by the Ming army and castrated. He became a servant to a Ming prince, who later rose to become Emperor. The new leader wanted Chinese to extend its reach and influence, and charged his loyal servant with the task of raising and equipping a large fleet for exploration.By the turn of the 15th century, China was already a highly advanced civilization, rich in culture, technology, weaponry, and sea navigation. The expeditions of Zheng Ho resulted in China expanding its influence over much of Asia, and spreading Chinese culture to many parts of the world. Soon after the final expedition, during which Zheng He died during a stopover in India, China became a closed culture, cut off from much of the world during subsequent reigns of emperors and dynasties. As China has begun to emerge from this 500 year period of relative isolation, the memory and legacy of Zheng He has awakened along with it. 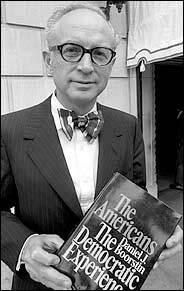 In 2004, the great American historian Daniel Boorstin died after a long and prestigious career. In addition to winning the Pulitzer Prize for The Americans: The Democratic Experience in 1974, Boorstin served as the 12th Librarian of Congress from 1975 to 1987. Here is a brief of this great American.The American historian Daniel Boorstin died this weekend after a long and prestigious career. In addition to winning the Pulitzer Prize for The Americans: The Democratic Experience in 1974, Boorstin served as the 12th Librarian of Congress from 1975 to 1987. He was a truly great historian and one of the most vocal advocates of literacy in 20th century America. He championed the acquisition of volumes of manuscripts for the Library of Congress and helped create both the Center for the Book and the American Folklife Center. Boorstin was one of the most important historical writers of the 20th century. He published 20 books, including a trilogy on the American experience and one on world intellectual history. But what made him wonderful was his absolute commitment to the value of books and reading. In his acceptance speech upon becoming Librarian of Congress in 1975, he commented that “Mankind has never produced a technical feat to match the book…the computer can help us find what we know is there. But the book remains our symbol and our resource for the unimagined question and the unwelcome answer.” During his term as Librarian of Congress, Boorstin established the Center for the Book to encourage reading and literacy. He also started the effort to renovate the Thomas Jefferson Building, restoring the Library’s main building to its original 1897 condition. Daniel Boorstin fit the perfect image of a university professor and librarian. Routinely donning spectacles and a twead jacket, he spent much of his life behind a typewriter or in a library. Not long after his appointment as the Librarian of Congress, he organized a press conference. In front of the cameras, he produced an ancient blue cardboard box with a small key dangling from it. He then ceremoniously unlocked it. Inside were the contents of President Abraham Lincoln’s pockets on the night he was assassinated. They included: two pairs of spectacles; a lens polisher; a pocket knife; the fob of a watch; a leather wallet; a linen handkerchief; and nine newspaper clippings. Boorstin had found the box, on a shelf in his new office, untouched for many years. He said his purpose in doing this was to “throw open the great brass doors of the Library of Congress, to open unopened boxes, and to bring the world of books and learning to as wide a public as possible.” He had a mission to bring people closer to literature and history. Boorstin was, above all, pragmatic. He said that he believed that America was founded on pragmatism rather than ideology. His favorite president was Thomas Jefferson, who also held pragmatism in high regard. His favorite historian was Edward Gibbon, the 18th-century historian who wrote The Rise and Fall of the Roman Empire. Boorstin often commented that Gibbon was an amateur, not unlike himself: no professional association or doctorate in history and hence no need to adhere to the rules he was meant to follow. I first became interested in interviewing veterans after watching a television interview with Stephen Ambrose, in which he described the Veteran’s History Project , an ongoing effort sponsored by the Library of Congress to collect first-hand accounts from veterans of 20th century conflicts. The need for this effort, according to Ambrose, is great since we are “currently losing World War II veterans at a rate of 1,100 to 1,500 a day.”I found that rate astonishing. I thought about the veterans I know, many who served in Vietnam and the Gulf War, and some who fought in Korea and World War II. I found it strange to think that one day they would all be gone, and that I would soon live in a time in which there were no remaining veterans of World War II. Likewise, my kids would someday read an article about that the few remaining Vietnam vets gathering for some type of ceremony. I thought that volunteering might not only be an incredibly satisfying experience, but would also (at least in a small way) serve the interests of future generations who will want to know more about our involvement, and hear the oral history accounts of the men and women who served. 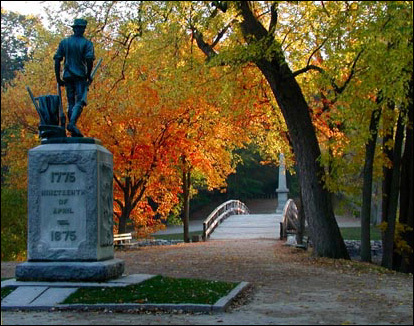 Ambrose went on to explain, and I’m paraphrasing now, “Just think about how wonderful it would be if today we were able to hear Lee’s or Washington’s accounts of the events that surrounded them.” I joined the effort, and can honestly say it has been a wonderful experience. It is very simple to participate. First, you need to find a veteran willing to be interviewed for the project. Talk to friends and relatives who might know of a willing participant. If you don’t know any personally, there are many organizations that can put you in contact with veterans, including state chapters of Veteran’s of Foreign Wars (VFW), the American Legion, AMVETS, Disabled American Veterans (DAV), Japanese American Veterans Association, Vietnam Veterans Association, Military Chaplains Association, The Retired Enlisted Association, and the Women Airforce Service Pilots of WWII. Next, you can request an interview kit via an online form at the Veteran’s History Projext website (http://www.loc.gov/vets/), or download the forms directly from there. For information on actually performing, recording, organizing, and submitting your interviews, there is a guide on the website as well. If you’re already involved, drop me a note at neil@thinkaboutit.com and let me know if you have a cool interview to post on Think About It. Welcome to Think About It. This is a website devoted primarily to my love of history. I’ve always loved history. Well, let me clarify that- I complained just as loudly as any other high school student who was force-fed dates and names like buckets of castor oil. And like most students, I often remarked to myself, and occasionally to my teachers, the question posed a million times each school year by kids all over the planet- “how in the world will memorizing [insert fact here] help me when I get out of school?” Not that memorizing the date of the Battle of Hastings hasn’t proven useful over the years (it’s 1066 A.D., for trivia’s worth). But like most people, I found it difficult to grasp history’s true worth, let alone stay awake during lectures. My parents were born in Ireland, and we went there a few times as a family when I was young. 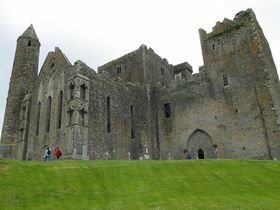 I remember going to Cashel, a castle, during one of our day trips. “The Rock of Cashel” is just outside of Dublin on the road to Cork, and is built upon a hill of solid rock. It was built in the 4th century and was the seat of kings and medieval bishops for 900 years, continuing as an important castle until the early 17th century. Cashel was the original fortification of the Eoghanachta, or kings of Munster; Brian Boru, a legendary Irish king, was crowned there in 977. As a boy, I gazed upon this fortress from the street below, and began to imagine all of the battles that must have been waged on that very hill. As I stood within the walls of the castle with my father and a cousin, I suddenly became very aware that my shoes were touching the very stone upon which these ancient people had walked, run, played, fought, and died. I could run my hands along walls that had seen those battles, along with great feasts and other important events. I peered through the long slits cut into the massive stone walls which protected the inhabitants from the arrows of attacking archers. I imagined the hearths ablaze with fires, the gates and walls guarded by sentries, and the halls busy with activity. I thought to myself- what a cool place to have lived in! I told my Dad what I was thinking. He smiled, and agreed that it must have been really something to have lived in such a place during such a time, though he gently pointed out many of the modern conveniences that weren’t available to kids back then. We talked about how tough it must have been to live and survive in such conditions. As I grew older, and began to read a lot of history, I realized that I did love history- I just didn’t like the way it was taught to me in school. And while the subject of history isn’t exactly an ice-breaker in most daily conversations, I find that knowing more about current and past civilizations, cultures, religions, species, and even the earth itself has helped me to better understand and communicate with people from different backgrounds and experiences than my own. And as I begin to view the future as history that simply hasn’t happened yet, my perspective on how one can choose to spend one’s life sharpens, and I draw strength from knowing that countless numbers of people have encountered the same types of life challenges that we all face sooner or later- being a good husband and father, protecting your kids, making a career, doing the right thing, etc. The thing is, well-written history can bring alive people, places, and events that took place even thousands of years ago, and place them squarely in today’s context. It can teach us things, if we are willing to listen. It’s all a matter of perspective. To me, virtually everything is history, or certainly one day will be. So what about the name, “Think About It?” For me, the term is meant simply to suggest that we all have much to gain from learning about important and interesting history. We gain a richer appreciation for our lives, and perhaps view it in the context of an opportunity, rather than as a given. As far as the site goes, Think About It will focus on many topics, including the history of ideas, exploration, music, film, technology, and the earth itself. This site will offer articles, commentary, book and film reviews, occasional guest articles, interviews, and links to other interesting sites. I hope you enjoy the topics and information put forth. Hopefully, history will be kind.